on the surface of the eye. Antibodies are important to keep the infection away. Dry eye, also called dry eye syndrome, is a common but chronic condition that occurs when your eyes do not produce enough tears or the tears produced are not of good quality. The symptoms of dry eye are redness, stinging and burning sensation, blurry vision, sensitivity to light, itching, difficulty in wearing contacts, and a feeling that there is something in your eyes. Dry eyes can be very uncomfortable. There are many causes of dry eyes including external environmental factors and factors that are related to the internal functioning of the eye and its components. These factors affect disrupt the complex tear production process. The common causes for dry eye are exposure to windy or hot environment, use of contact lenses, certain medical conditions such as blepharitis (inflammation of eyelids), side-effects of certain medicines such as antihistamines, beta blockers, and antidepressants, hormonal changes such as during menopause, pregnancy or when using birth control pills (contraceptives). Natural aging affects the process of producing tears from the glands in your eyes which can eventually result in dry eyes. The condition can affect anybody, but the risk of getting dry eyes increases with age. Women often are more at risk for developing the condition. Dry eyes can be treated with drugs that reduce eyelid and cornea inflammation, eye inserts called punctual plugs, artificial tears, and tear-stimulating drugs. Your doctor can diagnose the dry eye syndrome by performing a thorough eye examination. He can recommend tests that aim to measure volume of tears and the quality of tears in your eyes. Schirmer test is a common test to monitor tear production. What is Dry Eye (Dry Eye Syndrome)? Dry eye is a common eye problem that occurs when your eyes do not produce enough quality tears or when the tears evaporate too quickly. The tears produced are inadequate and/or of poor quality. Dry eyes feel quite uncomfortable and can make it difficult to perform certain activities such as watching a TV or using a computer for extended time periods. Eye Drops for Dry Eyes (Artificial Tears or Eye Lubricants): How to Relieve Dry Eye Syndrome? 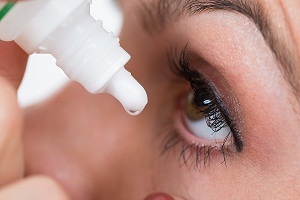 Eye drops are generally the preferred method of treating dry eyes. Many prescription and over-the-counter eye drops are available that a doctor may choose from and recommend for you based on your condition. These eye drops are often called artificial tears because they replace the missing water in the tear film of your eyes. Your doctor will first do an eye examination. Generally, the eye exam provides enough inputs to confirm whether you have dry eyes. If the test results are uncertain, your doctor will order some other tests. Schirmer's test is a common test for diagnosis of dry eyes that identifies volume of tears produced. No permanent cure exists for dry eye syndrome. Many medical treatments are available that aim to easy the symptoms and feel you comfortable. The treatment your doctor chooses depends on the severity of the condition. Most cases can be managed with the use of lubricants that serve as artificial tears. 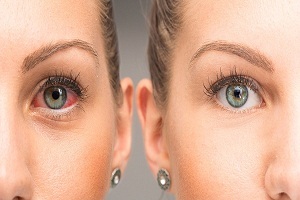 Dry eyes symptoms generally affect both the eyes. The symptoms tend to come and go. This is a chronic eye condition and usually gets worse over time. You may experience pain, stingy or burning sensation in eyes, and redness. 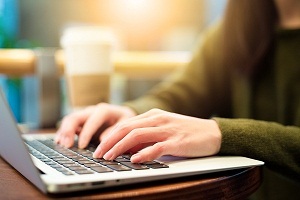 Your eyes become tired when you are at computer or reading for a prolonged time. Dry eyes are caused to lack of enough good quality tears or due to evaporation of the tears form the surface of the eyes too quickly. 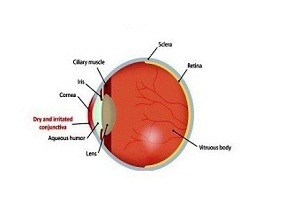 This causes a deficiency of lubrication affecting the health of eyes. Common causes of dry eyes are ageing, side effects of certain medications, certain medical conditions, and hormonal changes.